It is thick, yet narrow, over the vertebral bodies where it is loosely bound to the periosteum. At the levels of the intervertebral disc, it widens and the fibers strongly bind to the fibrocartilage disc, the hyaline cartilage vertebral end plates, and the margins of the vertebrae. 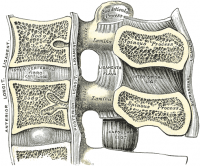 A primary spine stabilizer about one-inch wide, the ALL runs the entire length of the spine from the base of the skull to the sacrum. It connects the front (anterior) of the vertebral body to the front of the annulus fibrosis. It’s attached to the upper and lower edges of each vertebral body. Limit extension of the vertebral column and reinforce the intervertebral disc. 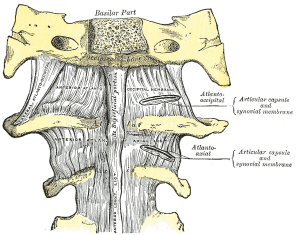 Located on anterior surface of the bodies of vertebral column. Patient demonstrates limitations in mobility with focal tenderness.